Business owners and residents in Pentwater, Michigan put up signs expressing opposition to Scandia Wind's offshore turbine proposal. There’s been a lot of outside interest in Michigan’s coastal wind supply. There have been multiple proposals for land-based wind farms in Michigan. But only a couple of companies have set their sights offshore. One company in particular has met some tough opposition. Scandia Wind came to Michigan last year looking to install 50 to 100 wind turbines in Lake Michigan. They had plans to site a wind farm six miles outside of Mason and Oceana counties. Colleen Plummer lives in southern Mason County. She owns the Antler Bar in downtown Pentwater. The restaurant is a short walk from the beach. If the turbines were built there, you could see them from the shoreline. Plummer is worried about how the project could affect her small town community. A lot of locals worry about the impact the project would have on tourism. 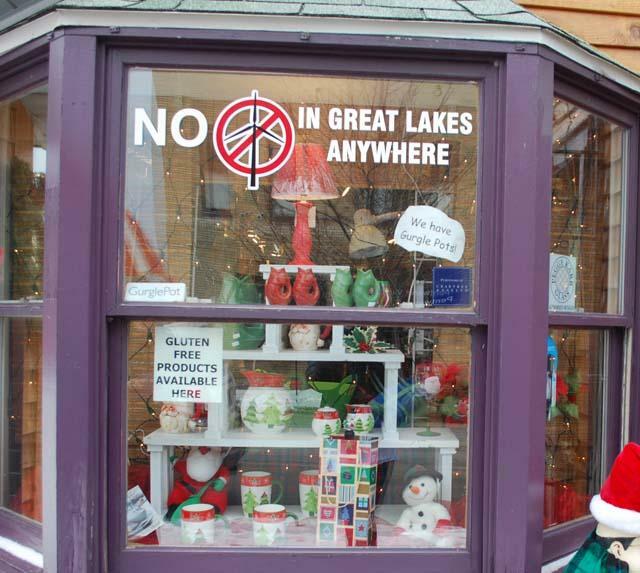 Last winter, signs with slogans like “No Mistake in the Lake” went up in storefronts and on car bumpers in Pentwater. Jeff Hodges and about ten other people got together to start the POWER Coalition. POWER stands for Protect Our Water, Economy and Resources. They formed the group to oppose Scandia’s offshore wind project and any others that might follow. When Hodges first heard about Scandia’s proposal, he says he thought it was a joke. Hodges says he’d rather see other clean energy alternatives explored. Steve Warner is CEO of Scandia Wind. He says his company’s project would benefit Michigan’s economy. Officials in Mason and Oceana counties disagree. They rejected Scandia Wind’s proposal. Warner has since moved his sights about 90 miles further south to Ottawa and Muskegon. Warner says Michigan companies could take the lead in producing the parts to build turbines. Despite all the opposition, there are some people who do want an offshore wind farm near their homes. In Muskegon, residents approached Scandia Wind. They want Scandia Wind to do studies to see if their coastline is well-suited for wind turbines. Legally, Scandia Wind doesn’t need resident approval, but the company says they want this kind of support. But there are still a lot of obstacles before a developer can start building offshore. James Clift is Policy Director of the Michigan Environmental Council. Clift says in order to move forward, a company also needs a federal permit. He says offshore wind is such a new concept in Michigan that the state doesn’t even have the laws in place to regulate this industry.